[AUTO](VC/RC):During your main phase, when your opponent's rear-guard is put into the drop zone, this unit gets [Power]+3000 until end of turn. 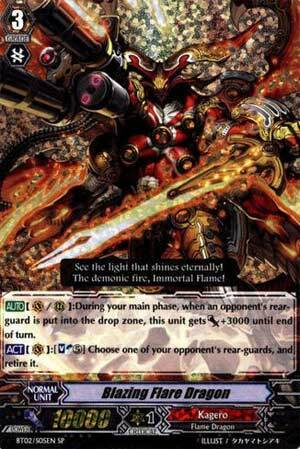 [ACT](VC):[Soul Blast (5)] Choose one of your opponent's rear-guards, and retire it. Only Kai could make such a mediocre card look so awesome. Blazing Flare Dragon has always had trouble holding its ground against the rest of the game. Building a total of 5 soul is a tough sell for Kagero (curse Conroe for not returning to the Soul! ), and losing deck space just to play its less-than-stellar superior ride pieces or Vortex Dragon is nothing to be proud of. A bonus 3000 power for retiring something isn't too bad, though, especially since it kicks in for both Vanguard and rear-guard copies of the card. That's an easy 21K with Bahr for an effective push, under simpler conditions than Dual-Axe Archdragon (outside Lawkeeper decks). Unfortunately, Blazing Flare's 10K defense and numerous late-game retires aren't helping it much in staying alive. [AUTO](VC/RC): During your main phase, when your opponent's rear-guard is put into the drop zone, this unit gets [Power]+3000 until end of turn. [ACT](VC): [Soul Blast (5)] Choose one of your opponent's rear-guards, and retire it. Oh the reminiscing…when I was first started this game and saw my opponent Superior Ride into this, I freaked out because this card looked SO badass. Back then; this card was one of the best Kagero units in the game second only to Dragonic Overlord. Unfortunately, nowadays, way too many things trump it, and Dragonic Overlord The End mainly takes over the Kagero clan for a majority of said players. It being at 10,000 power as a Grade 3 isn’t the best situation that you want to be in especially knowing that there are a good few 11,000 power Kageros already there and some of the 10,000 power units can trump Blazing Flare Dragon (Dragon Monk, Goku, Dragonic Lawkeeper, etc.). As for its skills, it gains +3,000 power when you retire something during your Main Phase. This can easily be done with Berserk Dragon, Demonic Dragon Mage, Kimnara and Gatling Claw Dragon. In short, if you retire one thing, then Blazing Flare Dragon will be at 13,000 power which can go toe to toe against Crossrides. If you can do it twice, then it’ll be at 16,000 that would normally make opponents have to guard with a 10,000 shield for one trigger to break. To top it off, this skill can work for a rear-guard Blazing Flare Dragon too, so it’ll get a nice power boost as well. For its other skill, if you Soulblast 5 cards, then you can retire any unit on your opponent’s field. This is a pretty hefty cost seeing how on the average game, you’ll be lucky to pull it off once let alone twice, but it’ll at least let you retire anything you like that is bugging you on your opponent’s field. It’s just the high cost that really bugs me though. Does that mean that this card is a bad card? Absolutely not. The thing is that this card is it’s own deck and combos extremely well with another underused card named Vortex Dragon. Think about it: you ride into Vortex Dragon and Soulcharge a few turns to build up soul only to ride into Blazing Flare Dragon a few turns later. I actually made a budget Kagero deck with these 2 ace units and dubbed it, “Blazing Vortex”, and was able to pull off Blazing Flare Dragon’s skill 3 times in one game thanks to Vortex Dragon and Flame Edge Dragon (Dark Irregulars come at me, bro!). In short, Blazing Flare Dragon is still a decent card, but only really made for fun/budget decks. Next time: Going to play Injustice: Gods Among Us for a straight weekend on PS3. Come add me! I remember last year thinking this guy was great; retiring an opponent’s rear guard for soul blast of 5, then gaining 3k for the turn for doing it. All it takes to add the 3k is to retire an opponent’s rear guard; it doesn’t have to be by Blazing Flare, but it does have to be by an effect, so Berserk Dragon, Kimnara, and Gattling Claw Dragon are all good candidates. Raising a vanguard’s power by 3k is extremely helpful for hitting those magic numbers (16k, 21k, etc.) easier, and Kagero specializes in rear guard hate, you should be able to get that boost regularly. It is also worth mentioning that the boost applies each time you retire during that turn, meaning potentially multiple boosts. After the first boost, though, getting a second is not too useful in terms of power. Backed by an 8k, a double boost would hit 24k, which is effectively the same as hitting 21k, unless you are attacking a cross ridden vanguard. Realistically, the retiring effect of Blazing Flare is not worth packing too many less useful cards into your deck just because they can soul charge. The most you will ever get is between 1 and 2 shots (requiring a whopping 10 soul). A big thing going for Blazing Flare Dragon is the potential to superior ride it from the deck using Blazing Core Dragon. The effect is similar to Ezel, except it requires a counterblast of 1, and the 2 units that must enter to soul do not include the starting vanguard, making it much less consistent than Ezel. Still, Lizard Soldier Conroe is able to search both the Gattling Claw, and Iron Tail Dragons, so it’s kind of doable. Rating: 2/5 – There are many better vanguards available, but the superior ride deserves distinguishment.